Because of charity laws, Women’s Institutes aren’t allowed to donate to national charities. However, we can fundraise for small, local charities or causes – so each year at our AGM in May our members vote on a charity to support. Some of the profits from our bi-annual Rag Market go towards our charity but we also try to put on one or two larger fundraising events during the year. In the past we’ve hosted cinema singalongs at the gorgeous Hebden Bridge Picture House and our resident DJ, Helen has been known to put on charity discos at The Trades Club. We aim to raise at least £1000 for our charity during the year we support them. We also use our social media presence, particularly our Twitter account to raise awareness of the work they do. One of our most effective fundraising techniques is Stand Up and Sit Down Bingo, which we play at most meetings. Everyone who wants to play puts £1 in a pot and then stands up and puts their hands on their head or their bum. Our president then tosses a coin. If it’s heads and you’ve got your hands on your head, you stay in and the people with their hands on their bums sit down. Conversely, if it’s tails the people who have their hands on their rear get to stay in the game. This goes on until there is only one person left standing. If we get down to two people, we bring them to the front and they stand back-to-back and we play the final round. All the money raised goes to our charity with the winner receiving a donated bingo prize. Sometimes the prize is given by members and sometimes we approach local shops and ask them to donate a voucher or a prize. If you’re a local business who would like to donate a prize out of the kindness of your heart and in exchange for a mention on our blog and our Twitter (and the goodwill of 50 local women), please get in touch. Stand Up Sit Down Bingo is a lot of fun and we recommend it to other WI’s looking for a quick game to play at meetings. To play The Amazing Human Fruit Machine you give us your hard earned pennies and we let you pull a rather suggestive big stick with a knob on the end. At this point three WI members (who can’t see each other) each hold up a piece of fruit. If the fruits all match, you’re a winner and we present you with a small prize of the tooth-rotting variety. It’s a real crowd pleaser because it’s utterly ridiculous. 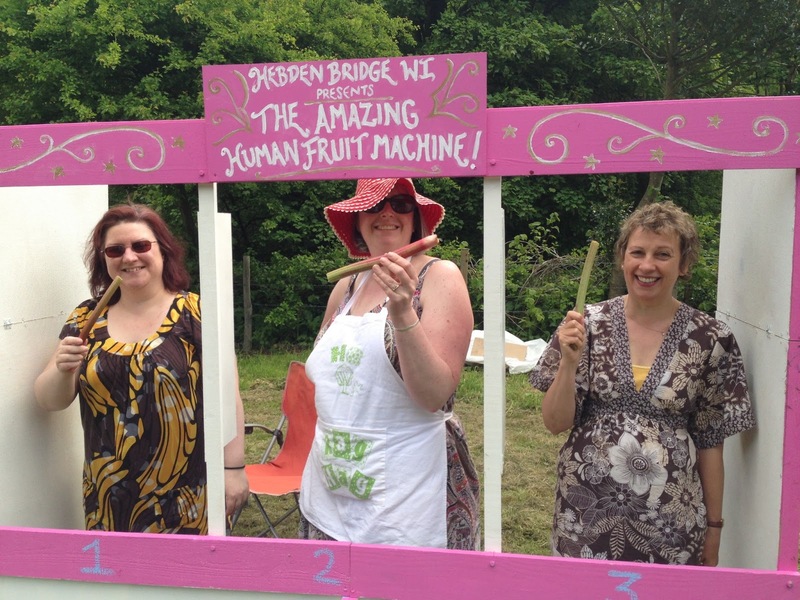 If you’d near Hebden Bridge and you’d like The Amazing Human Fruit Machine to come to your event, please ask us. We can’t do every event but if we can fit you into our schedule, we will.